Mission San Miguel Arcángel. Courtesy of Santa Barbara Mission Archive-Library. Father Fermin Lasuén founded Mission San Miguel, the sixteenth mission, on July 25, 1797. 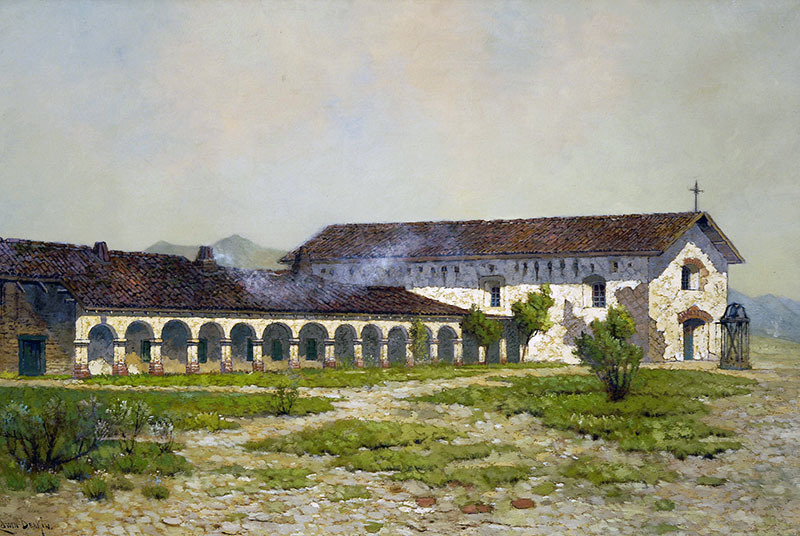 The site, in an isolated valley on the Salinas River, was chosen as a way to close the gap between Mission San Antonio de Padua to the north and Mission San Luis Obispo to the south. A fire in 1806 destroyed a temporary church that was built in 1797. Preparation soon began for the new church, which was constructed out of tile and adobe blocks. The large church, with walls six feet thick, was completed in 1818. The bright and vibrant interior frescos of the church were painted by native Indians under the supervision of Esteban Munras of Catalonia, Spain. The inside of the church has never been repainted. The pictures and murals we see today are original and considered to be the most authentic and well preserved in the mission chain. Outside the church stands the mission cemetery where two thousand Indians lie alongside a bronze statue of Christ. The mission museum features a sixteenth century Spanish wood carving of the mission patron saint, Saint Michael; victorious over Lucifer. The garden corridor is two hundred and thirty feet square and includes three sides of the mission quadrangle. Meanwhile, the nearby bell tower stands as it did in the early 1800’s. Between 1845 and 1870, secularization tore apart the complex as the mission property was distributed among the Indians. Surrounding buildings, except the church and priest quarters, were sold to individuals. Mission rooms were converted to commercial stores such as hotels, offices and saloons. On the morning of December 22, 2003 the Central California Coast was hit by a powerful earthquake. Mission San Miguel, just thirty five miles from the epicenter was severely damaged. Numerous cracks appeared in the Mission’s walls, rendering the building off-limits to the public. On October 2, 2009, following extensive renovations, the church along with the cemetery, marked its public reopening. Considered one of the eleven most endangered places by the National Trust for Historic Preservation, full preservation of the mission compound is ongoing. Northbound: US-101 exit #239A/Mission Street, proceed to mission. 9:30a - 4:30p daily. Please call 805-467-3256 for further information.